It’s okay. Go ahead and call it Frisco. I grew up obsessed with Herb Caen’s column in the San Francisco Chronicle. That may seem like a strange thing for an 8-year-old to have been reading, but it was on the page before the comics and I liked to earn my laughs. Plus, even as a kid, I found Danielle Steel’s comings and goings to be oddly riveting. Thing is, not everyone grew up a Herb Cain-super fan, so why the hell does everyone lose their cool when people say it? And is there really even a reason we shouldn't? Well, we decided to crack open some, uh, internet pages, and find out. The earliest known written usage of “Frisco” is in a letter written in 1849 by a New Englander who arrived in San Francisco by ship. He, like the New Englanders of today who tend to come here for a few years and then flee home to get married and have babies, was not impressed. Ignore the fact that the letter-writer was incredibly judgey, and instead focus on the apostrophe -- a clear indication that he viewed “Frisco” as an abbreviation. And though that is the first known written occurrence, it is also said “Frisco” might be an Americanization of “El Fresco”, the name Mexican gold miners gave the “refreshing, cool” city of San Francisco where they relaxed after panning for gold in the Sierra foothills. 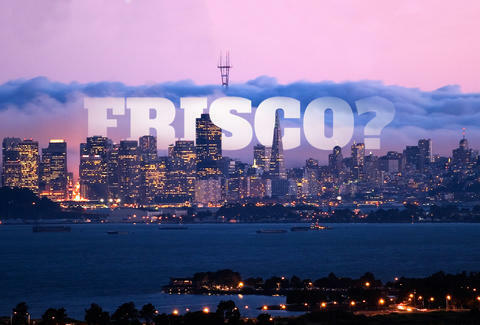 The actual, no-apostrophe word "Frisco" goes back to Middle English, and means “a port where ships could be repaired”. It's possible that the treasure hunters who flooded San Francisco during the Gold Rush were actually being quite clever with a play on a word when they created the nickname. I prefer the latter scenario for obvious reasons, but we’ll likely never know the exact origin. What is clear, however, is that the nickname stuck. Frisco was used 10 times (TEN TIMES!) in California newspapers in 1850, and appeared that year in the lyrics of “Oh, California”, a popular song sung to the tune of “Oh, Susanna”. When I find the gold lumps there I’ll pick them off the ground. A short story by C.J. Everett, The Gentleman from Honolulu, is published in which one of the refined characters talks of his trip to California and says he wishes he were “back in Frisco”. It's important to point out that Emperor Norton was not, in fact, an emperor, and that the eccentric (if not insane) English transplant gave himself that title. His blue uniform with gold-plated epaulettes, however, was gifted to him by officers of the United States Army post at the Presidio, a sign of just how celebrated and accepted he was by the citizens of the city, who also ensured he dined at the finest restaurants even though he was penniless (bonus fact: there's a statue of him above the bar at Comstock!). 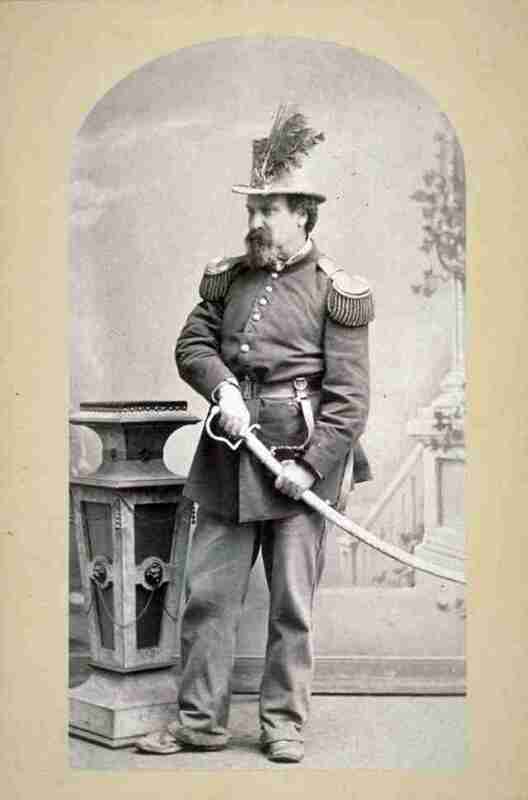 That Emperor Norton was so embraced by the upper class is perhaps the first sign that the nickname “Frisco” was viewed as beneath them. Wait. DID HE JUST SAY IT WAS OKAY TO CALL IT “SAN FRAN"? No no no no no. Jack London, who was born near 3rd and Brannan Streets (who knew?) writes a short story And ‘FRISCO Kid Came Back that fictionalizes his experiences as a child in San Francisco, in which, he is clearly the ‘FRISCO Kid. 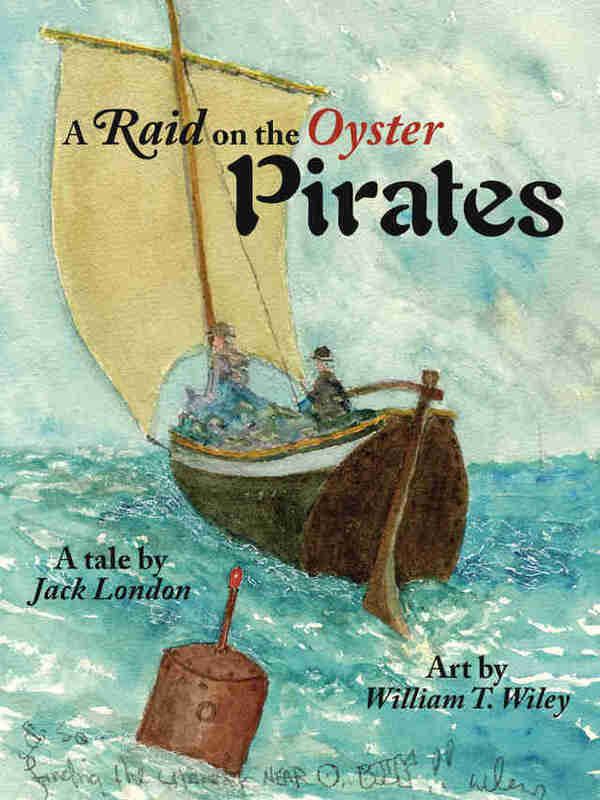 He later writes more about the ‘FRISCO Kid based on his days spent pirating oysters in the San Francisco Bay. “Frisco” may have been frowned upon by the upper class as the turn of the century approached, but London showed the nickname was alive and well amongst those who lived and worked on the waterfront. The Gold Rush helped SF’s population expand incredibly quickly. The city’s population surged from 500 people in 1847 to 300,000 in 1851 to 410,000 in the Spring of 1906. The millionaires built their houses on top of hills, and the workingmen -- the ones who called the city “Frisco” -- built their matchstick wooden houses along the South of Market waterfront. It’s also where the boisterous sailors and “hoodlums” who gambled and fought made their home. When the 1906 earthquake hit, that tinderbox of small businesses, rooming houses, and restaurants was the first to be consumed by flames. When the fire finally went out, the waterfront was totally demolished. As the city rebuilt itself, a ladies' group formed that was dedicated to ridding the city of its “Frisco” nickname once and for all. Convenient timing, don’t you think? Still, the nickname remained controversial. So much so that in 1918, a judge in San Francisco warned a man that he was “in danger of being interned as an alien enemy” after he called the city “Frisco” for a fourth time. The man, of course, was from LA. Obviously, no one in LA knows not to call SF “Frisco” either. 1932 marked the beginning of a slew of Hollywood films with “Frisco” in the title (Fog Over Frisco & Hello, Frisco, Hello), starting with Frisco Jenny, a film about a 1906 orphan who becomes a successful madame. Sounds kind of good, actually. This is when it all really, TRULY began. Sure, Emperor Norton and that ladies’ group (and even a judge) had spoken out against “Frisco”, but it’s when Herb Caen’s book, Don’t Call it Frisco, is published that not calling it “Frisco” really becomes "a thing". Nevermind that Herb Caen was born in Sacramento, his “love letters to San Francisco” that appear in the San Francisco Chronicle make him a household name and an authority on The City. About “Frisco,” he writes, “No one refers to San Francisco by that title except people from Los Angeles." And since there is nothing San Franciscans hate more than LA, Herb’s directive sticks. Sort of. The Hells Angels call San Francisco “Frisco”. Who wants to tell them they’re wrong? Any volunteers? Anyone? Oh, you there! Wait, what? No, Jax Teller is not in that one. Still no one then? Sal Paradise, Jack Kerouac’s alter ego in On the Road, says he’s heading for “Frisco”. This fact alone makes it somewhat surprising that more 19-year-old boys don’t embrace the nickname. Otis Redding writes “(Sittin' On) the Dock of the Bay” while hanging out on a rented houseboat in Sausalito. He and his five bandmates die in a plane crash just three days after the song is finished. It is the first posthumous single to reach number one on the Billboard music charts. The lyrics “I left my home in Georgia, headed for the Frisco Bay” are about Otis coming to San Francisco to perform. Try not to cry the next time you hear it. Dare you. Herb Caen’s directive has taken hold and no “self-respecting” San Franciscan allows his tourist friends to call The City “Frisco”. Rappers, however, don’t give a f**k. Yes, Too Short was born in LA, but (!) he moved to Oakland when he was 14 and that’s what he called home, as evidenced in “It’s All Good,” a song from an album that every white high school boy in SF played endlessly while driving his parents Beemer around town. I got one up in E.P.A. And two down in South Central L.A.
Frisco Tattoo opens in The Mission and has given “Frisco” tats on stomachs and necks ever since. Why the name Frisco Tattoo? Because people didn’t like it. Based on all this, "Frisco" basically used to be an affectionate nickname given to the City by the Bay by those who came here to chase their dreams. And though the “elite” outgrew the nickname, wanting to put their pasts behind them as they saw their dreams unfold in the form of Nob Hill mansions and mentions in the society pages, it stuck with the folks who worked hard and played harder. It stuck with the people who didn’t care what others thought about them. It stuck with the people who loved the Frisco Bay and would call it whatever the hell they wanted. San Francisco has always been divided by class, and it likely always will be. However, the class war has been front page news lately. We’re angry about the Google buses, annoyed about the Twitter tax breaks, pissed off at the tech bros who are driving up real estate prices. “We” have more in common with the guys on the waterfront than the ladies who lunch, and yet “we” insist it shouldn’t be called “Frisco”. Doesn’t make a whole lot of sense. So, can we call it Frisco? I say yes. We can call it Frisco because Frisco is our history. Frisco is where we came from or moved to. Frisco is a celebration of everything about San Francisco that is unique and diverse, revolutionary and renowned, open and accepting. We can call it Frisco because Frisco is who we are. Or at the very least, who we should aspire to be. Even Herb Caen got that. It’s not often noted that Herb relented his stance on the controversial nickname in a column he wrote in 1977, but he did. I don’t want to honor the old, rich men who thought they were above the working class; I want to honor the men and women who built this great city and made it what it is today. And I’m going to do that by reclaiming Frisco. Daisy Barringer is a freelance writer who grew up in SF, and regardless of her new-found love for “Frisco” will never be okay with the people who call it “San Fran”. Follow her on Twitter @daisy.